Born to celebrity actor parents Shakti Kapoor and Shivangi Kolhapure on 3rd March 1989, Shraddha Kapoor has made a mark for herself in a short span of time with some big films. Known as one the most successful Bollywood actresses from the current lot, she has donned ‘the girl next door’ image since making her screen debut in 2010. With ‘Half Girlfriend’ opposite Arjun Kapoor and ‘Haseena: The Queen of Mumbai’ coming up this year she is the star to watch out for. As the Bollywood actress turns a year older, we look into some of her unknown and interesting facts which many of her fans and admirers aren't aware of. Many think that Luv Ka The End was Shraddha Kapoor's Bollywood debut but she made her screen debut in Leena Yadav's Teen Patti in 2010. The film starred Amitabh Bachchan, Ben Kingsley, R. Madhavan and Raima Sen. Though she had a small role where she played a studios geek named Aparna but somehow got overshadowed by the presence of other stalwarts. Not many know that music runs in Shraddha's family which has dominated for nearly four generations. 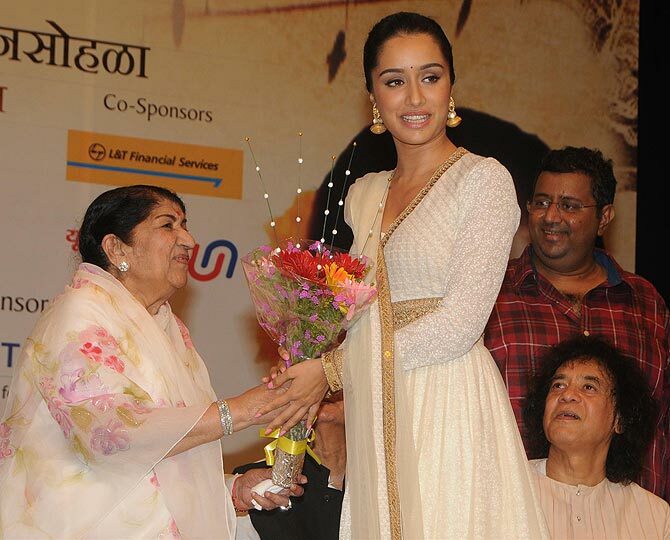 Shraddha’s mother, Shivangi Kolhapure is the niece of Lata Mangeshkar. Shraddha’s maternal grandfather, veteran classical singer Pandharinath Kolhapure is Mangeshkars' cousin. Hailing from a family of singers from her maternal side, Shraddha Kapoor made her singing debut with the song Galliyan Galliyan…Teri Galliyan in Ek Villain and soon followed it up with Do Jahaan in Haider and Bezubaan Fir Se in ABCD2. Watch her crooning Galliyan Galliyan…Teri Galliyan. Shraddha Kapoor being an ardent fan of Bollywood films since childhood had a few idols whom she adored as actors. Aamir Khan and Amitabh Bachchan top her list in the male category whereas her favourite actresses have been Priyanka Chopra and Nutan, respectively. Coming from a film background it was but natural that Shraddha took a liking to Hindi films. Her all time favourite romantic movie is Guru Dutt's Pyaasa while her favourite comedy film remains Andaz Apna Apna which also featured her father, Shakti Kapoor as crime master Gogo. She has walked the ramp on quite a few occasions and endorsed a few popular brands which include Lakmé, Secret Temptation, Veet, and Lipton Green Tea, Jewelsouk, etc. She has also launched her own line of clothing for women, named ‘Imara’, in association with Amazon.com. Watch her in a ‘Veet’ ad here. She was ranked number 5 among the ‘100 Sexiest Women In The World’, 2013 in a poll conducted by FHM India. Katrina Kaif topped the list followed by Priyanka Chopra at No 2, Deepika Padukone at No 3 and Anushka Sharma at No 4. The actress finds herself listed in the 2016 Forbes magazine issue among the top promising young leaders in the entertainment sector. This is the second time she has been featured in the Forbes list. She was earlier ranked 57th on the 2015 Forbes Indian Celebrity 100 with annual earnings of $1.3 million.